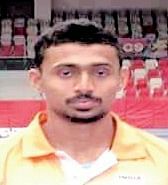 KOCHI: Muhammad Anas, an athlete of the Indian Navy, has qualified for the Rio Olympics in the 400 metre race. Anas, who broke the national record twice, is the third male athlete in the history of Indian athletics after the legendary Milkha Singh and K M Binu to have qualified for a 400-metre event in the Olympics. Anas clocked the exact qualifying time of 45.40 seconds on June 26, 2016, at the Polish Athletics Championship held in Poland. Anas was scouted by the Navy at the National Games held in Kerala in February 2015. He joined Indian Navy on May 7, 2015, and was placed under coach T G Ajesh, a former international athlete. He won silver medal in the 400-metre event in his maiden Inter-services Championship held in Hyderabad in July 2015, and won silver medal in his first Senior National Athletics Championship held in Kolkata in September 2015. He improved his timing to below 46 seconds for the first time in the Indian Grand Prix and the Federation Cup events held in New Delhi in April 2016. Currently, he is in the National Camp under the guidance of Muhammad Kunhi, a former champion of Services (400 m) and national coach. Muhammad Anas, son of Sheena and the late Yahiya, studied at Nilamel MMHS School, Kollam, and Mar Basil School, Kothamangalam, and later joined Sreekrishna College at Guruvayur. He won the Calicut University Championship twice, and bagged silver medal in the Indian University Championship-2014. He was part of the 4x400 m relay squad of Kerala that won silver medal in the National Games-2015, where he was picked up by the talent scouting team of the Indian Navy.